Home shows. Industry shows. Craft Fairs. They’re all great opportunities to market your small business and sell your wares. Whether you have a trade show circuit that you run regularly or are exhibiting at your one and only event of the season, the same principles of show success apply. If you’re an artist or crafter, you already know this, but it applies to every business. The first secret of selling more at any show or fair is that you and your products and services will be judged partly by those around you. So bluntly, if the stuff around you is junk, the perceived value of your products and services will suffer. Likewise, if everything around you is top-notch, your products and services will immediately gain luster. So it’s important that you research any place you’re planning to sell ahead of time as best you can. Before you attend that trade show, choose the best shows for your products and/or services and prepare in advance to maximize your profit. Price is not about what it’s worth; it’s about what it will sell for. 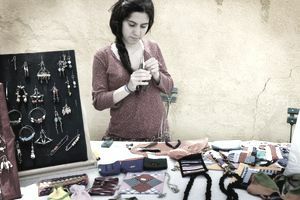 Novices often make the mistake of pricing their products and services according to materials and/or time put into them. For instance, a person who creates wooden toys will add up the cost of the wood, glue and other materials that they bought to produce the toys and then add in the hours they spent cutting and carving them to come up with what the toy is worth – and then write that on a tag or a sign as the price. But that’s not a price; that’s how you do a break-even analysis. Okay. What’s the difference between a painting of a soup can and a painting of a soup can by Andy Warhol? If you answered “millions of dollars”, you’re right. But do you really think that Andy Warhol spent hundreds and hundreds of hours creating that one painting? So to establish an appropriate price, yes, do a break-even analysis first, because that tells you the price you must not go below if you’re going to make any money. Then do the research necessary to check out your competition and make note of what they’re charging for the same or similar products or services. And then choose your strategy. Are you going to charge less, the same or more than your competitors for your products or services? Remember, you should only charge more if you can justify the increase as a perceived value to the customer. In other words, take a hard look at yourself and your product or service. Are you the just anybody who painted the soup can or an Andy Warhol? Most of us fall somewhere in between – and that’s the art of pricing. Create a trade show display that's going to draw customers to your booth. Think visibility first, before anything else. Before you can sell anyone anything, you have to get them to your booth. If you’ve ever attended a large trade show, you know that there seem to be big electronic display screens everywhere, showing everything from flashing words through full-length movies about attendee’s products. Well, that sort of thing might work for you too, depending on your venue and what you’re selling. But you don’t have to use a screen to get people to pay attention and come over. At a recent farmer’s market, one of the vendors was dressed as a pirate (which tied in perfectly to the name of his farm) and his stall full of vegetables was mobbed. At an art/craft show, we came across an all-white booth with a person dressed all in white, including a white head-covering. Nothing else was visible. That’s right. A steady stream of people kept approaching that person and asking them what was going on – a perfect selling opportunity. Now you don't need to have to have a screen or dress up to increase your stall sales, but definitely, you have to make your booth and your wares visible to prospective buyers somehow. Actively engage visitors to your display. Just standing there and letting people look at things is not going to engender the number of sales you're dreaming of. Sure, if your products or services are enticing enough, some people will buy. But most won’t. Here’s another secret for you- most people are running a loop of reasons ​not to buy through their heads when they’re looking at your wares. Your job as a salesperson is to counter those reasons and give them a reason to buy instead. One reason that works for many people is the reason explained in the nest point below. But there are all kinds of other reasons that lookers will turn into buyers, from the quality of a product through how easy a product would be to send to someone as a gift – all reasons that will never get activated unless you actively engage with the people that visit your booth. Create and play up the back story. Another secret you’ll want to apply as much as you possibly can when you’re chatting to potential customers: (almost) every person loves a story. So give them one. How was it made? Where is it from? Who else owns one? Or even sometimes Who else owned that one? These are all questions that prospective buyers might ask about a piece or a service if they were interested in it. So turn it around. Stimulate their interest by giving them the answers to the questions they might not have even thought of. Sometimes things come with their own provenance. Think antiques. Or things that celebrities have used. But if not, it’s not that hard to create one. It’s not just a necklace. It’s a necklace crafted from sea glass that you personally harvested from Canada’s rugged West Coast Trail. An appealing story can provide the added value that will clinch the sale. Take a moment to think about your typical sales transaction. Does it go like this? The customer says they would like to buy an item. You charge their cash/debit card/credit card for the amount of the sale. You wrap/bag the item and give it to them or make arrangements to deliver the service. They leave and you never see them again. The money is the return customer, not the new one. So anything you can do to encourage someone who has bought something from you to return and buy something else from you is a great thing. That’s why so many businesses have jumped on the loyalty program bandwagon. And there’s no reason why you can’t run some version of a customer loyalty program yourself. Straight punch card types where customers can buy x number of items and then get one free are popular, but I think programs that encourage customers to bring in other potential customers are even better – such as giving customers a discount card they can pass along to someone and then get a discount themselves when that card is turned in. If you’ve ever had the experience of being at a show or fair and watching people stream past your booth headed elsewhere, you know how depressing such an experience can be to both your pocketbook and your ego. But it doesn’t have to be that way. Use the advice I’ve given above to get people to stop at your booth and engage their interest – and watch your sales soar.